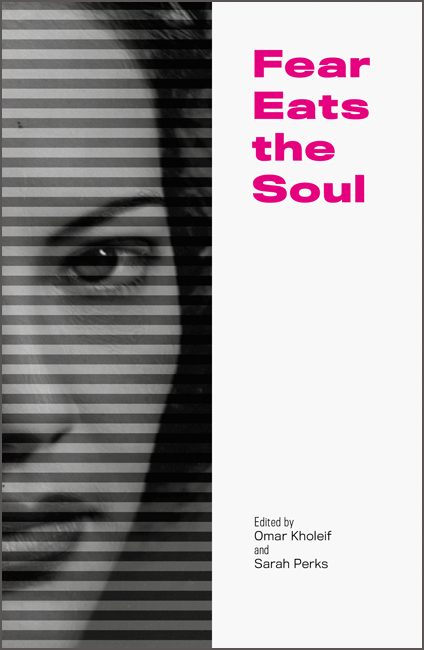 In Fear Eats the Soul, Omar Kholeif and Sarah Perks, HOME Publications. In his 2011 book The Queer Art of Failure, Jack Halberstam articulates a queer darkness through the writings of critical race scholar Daphne Brooks and the black mirror paintings of Monica Majoli. Although queer darkness might evoke the isolation, pain, unattainability, and horror of dark vitalism, it is directly coded as cultural, political, and social; queer darkness’ horror is the stuff of failure and the miserable. Queerness teaches us that darkness has gendered, sexed, and raced dimensions, and therefore aligns more with Galloway’s black boxing of the self. Halberstam writes, “darkness becomes a crucial part of a queer aesthetic…an aesthetics of opacity…an interpretative strategy…as well as a way of being in the world…the queer subject as shadow and shadowed seems to cast the construction of queerness as secondary to the primacy of heterosexual arrangements of gender and relationality, but in fact it comments upon the disruptive potential of shadow worlds.” Queer darkness is the refusal to cohere, to become legible, to see like a state; it also carefully attends to the relations of darkness and blackness. Queer darkness bursts forth from colonial rage, colored struggle, dissent in US slavery, and the decolonial project. Halberstam considers queer darkness as something that forms through particular subject positions, like the colonized and the slave, but also the punk, anti-social feminist, and butch woman. These subjects, dark for specific reasons, turn darkness into an opportunity for resistance, protest, and struggle. This essay has been translated into German for yet incomputable. Indetermination in the Age of Hypervisibility and Algorithmic Control, Materialverlag der HFBK , 2018. A previous iteration of this text appeared in Depletion Design: A Glossary of Network Ecologies, Theory on Demand 8, eds. Carolin Wiedemann and Soenke Zehle, Institute of Network Cultures, 2012.